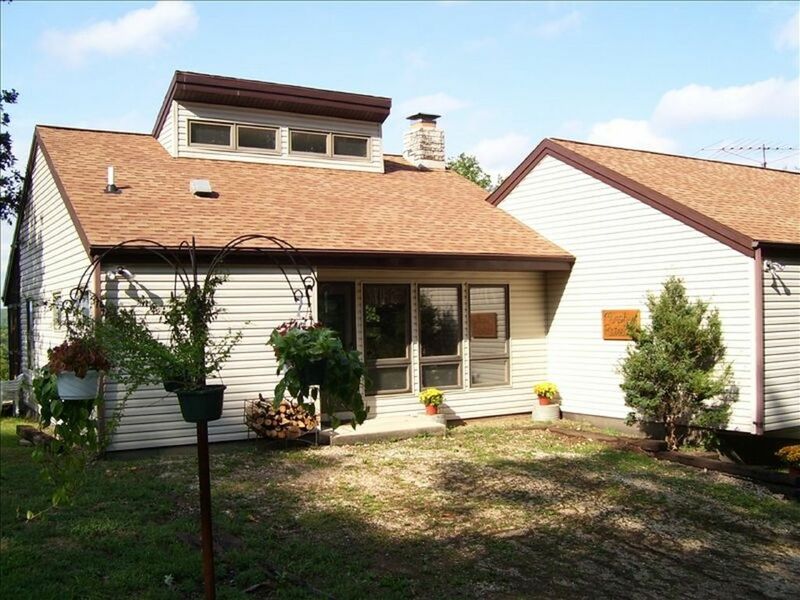 Murphy’s Retreat is a 3 bedroom house overlooking the Meramec River. With 2 and ½ baths, 1 queen bed, 2 full size beds, 2 twin beds, and a finished basement with a queen bed and queen sleeper sofa, it can accommodate up to 12 people. All linens for the house are provided and the kitchen is fully equipped. The large wood burning fireplace makes the living room a cozy place to gather and the screened in porch with a fantastic view of the river is a great place to sip your morning coffee.Bring your binoculars to watch the wildlife. Use of our pavilion and deck by the river is included in your reservation. Cabin rates are based on number of people, so please make sure to correctly enter the number in your group. Float trips are available by reservation. Peaceful Bend Winery is located just across the road and Meramec Springs Park is worth the 10 mile drive to visit, especially if you like to fish for trout. My name is Crystal. I live on a farm with my husband, Gerald and son, Clayton. I am slightly addicted to horses and love working with animals. I have stock dogs that help me with most everything I do on the farm. We have cattle, goats and a few chickens. We bought this piece of property with a lovely home on it from the family of a man named Sam Murphy because it joined our farm and we thought it would be a good place to try the vacation rental business. It went so well that we have since built two more cabins on the same property. We love meeting new people and sharing some of the great experiences of country living with others. Murphy's Retreat was our first vacation rental and the screened in porch overlooking the river is still my favorite spot on the whole Murphy's Place property. I love to sit out there and drink my coffe while listening to the river gurgling along down below. This home sits on a cliff overlooking the beautiful Meramec river. It is just a short walk or drive to the waters edge. It was a great property. Even though the weather was cold the wood burning fireplace made for great comfort. Very clean and had everything we needed for family fun. Thanks for everything. We are so happy you enjoyed our property! Thank you for the review. Your property far exceeded our expectations. We hiked, ate good meals, talked and laughed and gave thanks for the opportunity to spend time together in a wonderful atmosphere. Very nice property and wonderful views. Overall the property was clean and comfortable. Kitchen had everything you need. Wish we had brought more meals to eat in. The only negatives is some of the furniture is older and worn and bathrooms are a bit dated. The cabin is very roomy and comfortable. We would definitely stay here again. We enjoyed having a nice dinner out at Sybill’s in St.James. Avoid eating at Hick BBQ in Steelville it was not good. We had a wonderful time at Murphy's retreat and would recommend the place to anyone traveling to the area!! Crystal was wonderful and everyone else was so kind and amazing! It is a beautiful, comfortable, clean house with lots of room. The deck has a fantastic view and there is a great picnic table next to the deck. We had a wonderful stay and enjoyed the river. The pavilion next to the river is also very nice. Overall, everything was better than we expected. Perfect for larger groups and all of us noncampers! Thank you, Jane! It was great meeting you all and we hope to see you again! Finally a "cabin" that I love. Came to these parts from northern Wisconsin where every winter I would rent out a cabin on a frozen lake and enjoy the cold with a fireplace, some wine and a book. I have lived in MO. for five years and had not found anything to compete with those experiences. Since I was hosting a wine tasting at Peaceful Bend, I thought it a good idea to stay close by. The property was recommended to me by a couple different folks but still my expectations were low. Well, my expectations got a slap up side the head when our small group stepped inside this wonderful retreat. Terrific view, comfy beds, immaculate house keeping, a wonderful wood burning fireplace, and close to a winery. Pretty near perfect. Looking forward to next stay. Complete directions will be emailed to you upon completing your reservation. Do not use google maps. You will be lost.